The Learning Lab is found in Room 112 on the main floor of the HIL. 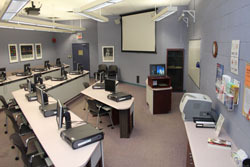 The Learning Lab is equipped with an instructor's workstation and 16 user workstations. The user workstations can be arranged with single or dual seating, allowing a maximum of 32 participants. Each user workstation is comprised of a Dell PC with a DVD drive, a sound card, USB ports, and a 22" digital flat panel monitor. Individual speakers and headphones are not supplied. Internet connectivity is provided through the UNB network, allowing access to UNB online resources. Printing is done through the student network, using the print credit system, with print jobs collected at the front of the lab. The instructor’s workstation is attached to a ceiling-mounted LCD projector and a quality stereo sound system for audio presentations. The remote control for the projector is kept in the desk's top drawer. The system does not support external connections / other devices at this time. A flip chart, presentation remote, and standard overhead projector are available upon request. Please see the Learning Lab Helpful Hints for more information.